The village in which I live has just had FTTC rolled out(NEWYL) so I'm pondering whether I should change over, and if so which provider I ought to select. My current ADSL2+ service and phone is through Xilo with the phone line on talktalk LLU, and that is/has been exemplary service. TalkTalk £18.50 + £16.70 line rental(unlimited but Do TT offer FTTC over BT lines? ), but customer service still reportedly poor. You've pulled various judgments out of the air that appear to be anecdotal. It has to be remembered that the biggest ISPs will be the ones leading to the most online complaints. You have also not set any sort of parameters as to what you are looking for - are you looking for static IP or bundled sports, for example? Your best bet may well be to make a shortlist and contact those ISPs to discuss your options. One key thing to remember during your deliberation is minimum contract length. Until recently I would have unhesitatedly recommended Plusnet. I obviously can't do that at the moment, but personally have not had any problems. See this post I made a few minutes ago, and the one to which it was a reply. I came to Plusnet from IDNet and have to say I wouldn't dream of going back even if I leave Plusnet. (I did look around a few days ago, before I discovered my problems were not caused by Plusnet). But I didn't leave IDNet because of dissatisfaction - simply price! At 50GB usage you may find AAISP Home::1 worth looking at to compare with the Xilo FTTC offerings. From what I see of complaints about Zen, those are rare suggesting a good broadband service, but generally indicate they don't pull the stops out for consumer-level problems. I withhold further comments for now - as per my linked post. The danger, of course, is that you can use more when switching to a faster connection. I don't hesitate in switching streaming media to the highest bandwidth setting on FTTC because I'm not interfering with other family member's usage of the connection. Since moving to FTTC, I also think nothing of downloading a 1GB or larger file, and I make extensive use of cloud storage. I was trying to encapsulate my feelings about Zen, but you've done a great job for me, Bob. On the whole they provide excellent service and have a UK call centre - I have never had any hesitation in recommending them. However, the pricing of Zen's consumer services does not include sufficient headroom to be able to offer the sort of assiduous pursuit of Openreach that the likes of AAISP will mount for an individual customer. My impression, based in part on my own experiences over the years, is that Zen will try fairly hard, but various people report Zen sometimes reaches a point where they feel unable to offer further help in the face of ongoing performance issues that appear to fall in Openreach's domain. I completely agree with your additional comments. I was trying not to get too complex in a single post . Thank you both for the advice, suggestions and information. David W. is correct that I pulled the judgements out of the air, based on what I've read, and I accept that the larger ISPs have more customers and so will attract a higher level of complaints. I'm not interested in bundled sports or such things. 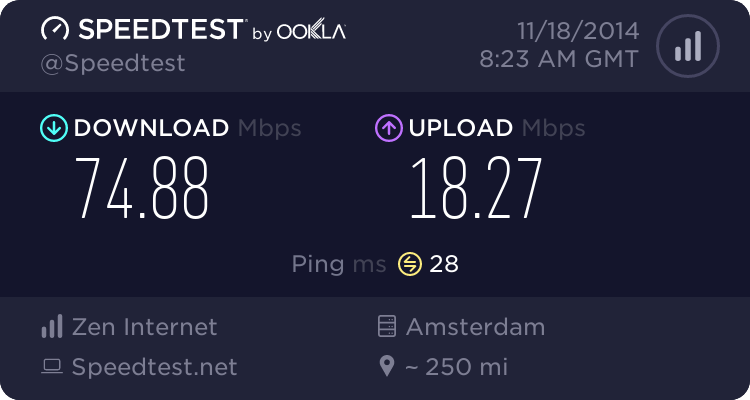 I mainly use the internet to stream music, occasionally play games, stream video etc and I'd probably stream more film/tv if I had a faster connection. Roberto, thanks for the pointer to AAISP, I've had a look and can see that I could get 100gb at 80/20 on their Home 1 package for £40 - but wouldn't I also have to pay a line rental on top of that and I occasionally need to make/receive phone calls? Length of package isn't a huge factor for me(unless something goes wrong) , apart from AAISP who have 6 month term all of the others seem to be 12 months except Plusnet that was 18 months. You would need to pay line rental to someone, yes. I haven't checked what AAISP do if it isn't with them - some ISPs charge more for the broadband in that setup. AAISP have the highest ratings by customers. I'll get in touch with them and find out. They seem to offer line rental on a wires only basis(ie no voice service) which is only £10. Yes they do, but you said you occasionally need to make or receive (land-line) calls. BT or TalkTalk. There is no need to subscribe to providers with usage limits and or traffic management these days. Particularly if they are higher price. BT if you want to use the free sport or free wifi when out and about. TalkTalk if you don't.